I first encountered these quirky little cakes on the eclectic (and ridiculously extensive) menu at Shopsin’s in the Essex Street Market on Mahattan’s Lower East Side. I thought they were a little off-beat but I liked the idea. Even so, I had no desire to make them at home. That is until I came across them in a magazine. 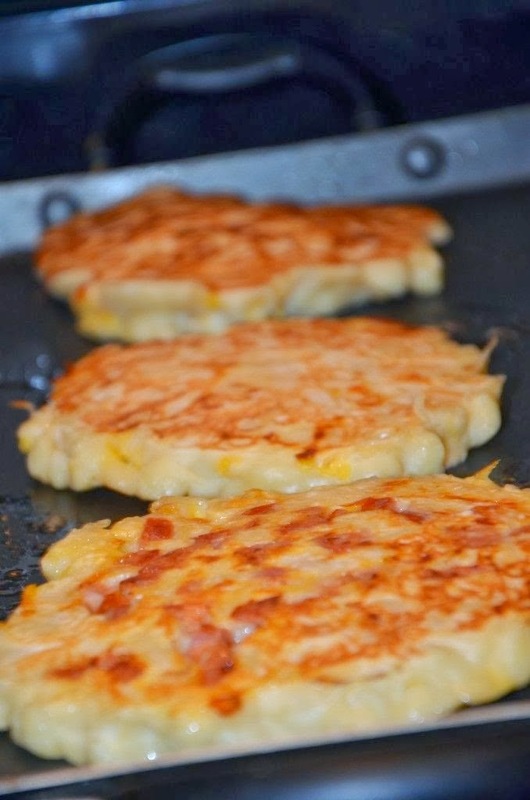 I was baffled to see them again: Macaroni and Cheese Pancakes. So I went for it. Why not? I’m a fan of sweet and savory. I’m a big fan of pasta. And cheese. And pancakes. In a large bowl, whist the dry ingredients. In a separate bowl, whisk together the milks, eggs and butter. Add the milk mixture to the dry ingredients and stir until just combined (the batter will be slightly lumpy) . Fold in the macaroni and cheddar. Pre-heat and lightly grease a griddle or large skillet over medium heat. Scoop batter onto the griddle to make pancakes. Cook until undersides are golden brown and slightly stiff, about 5 minutes. Flip and cook until second side is golden brown. Repeat with remaining batter and serve warm with syrup and hot sauce (if desired).